for lots of new photos in the New Year. Cycling Tip from Samantha: Wear windproof/waterproof gloves or mittens for winter riding, and always carry a bungee cord. Always. They're more useful to carry around than possibly even an allen wrench. Lauren rides a vintage Schwinn cruiser, but sorely misses her stolen vintage black ladies' Dunelt. 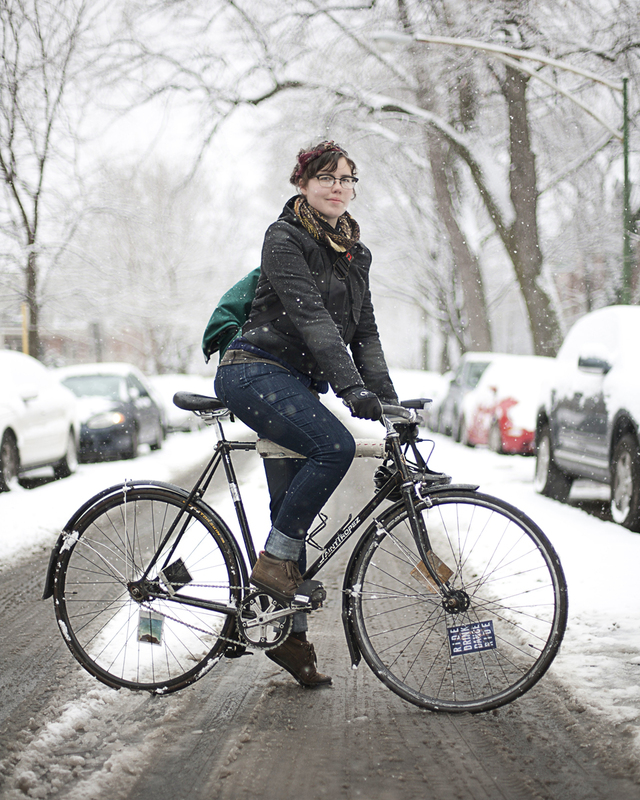 Cycling Tip from Lauren: Especially if you have decent tires, winter biking isn't nearly as scary as it sounds. 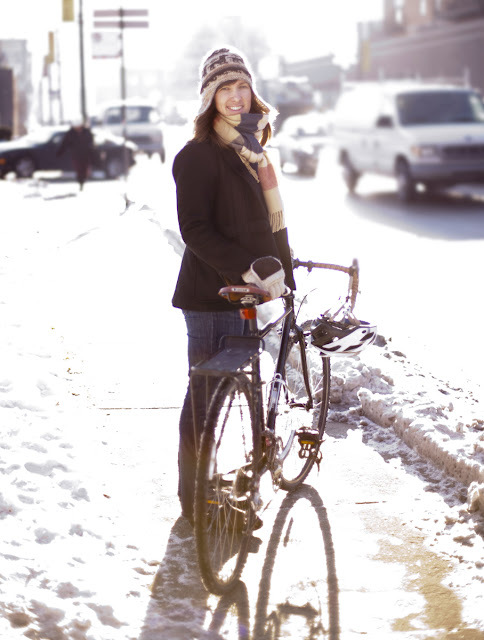 Just budget some extra time and bundle up with lots of layers. 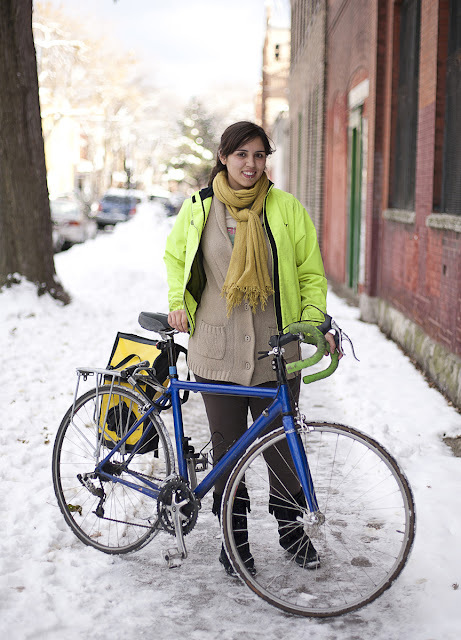 Cycling Tip from Jasmine: If you are cold, bike harder. Taryn rides a Vintage Gazelle Populair Dutch Style Step-through. 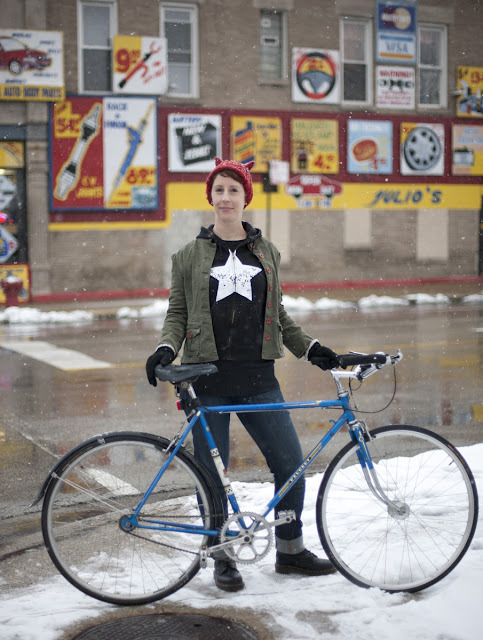 Cycling Tip from Taryn: Not everyone has a fast bike or wants to ride like Lance Armstrong, so have some patience for those of us on the commuter bikes or cruisers who might just be enjoying the ride. 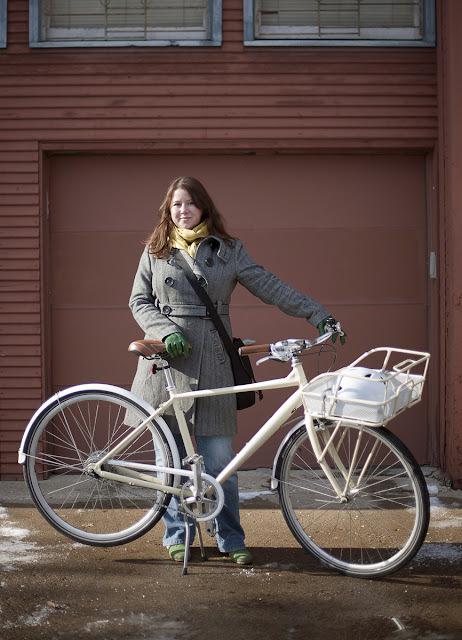 Megan Rides at Gary Fisher Simple City 8 named Francis with a a rear internal hub and front basket. Cycling Tip from Megan: Avoid alleys in the winter. The city doesn't plow or salt the alleys and with a little precipitation they quickly turn into dangerous ice slicks. Note: The steel basket on Megan's bike is large enough to haul most things she needs. 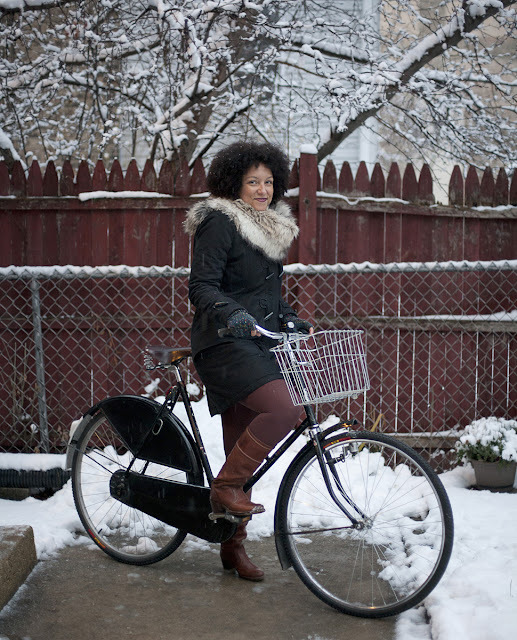 Since she doesn't own a car, she does all her shopping by bike. Winter weather has hit and all day it was hovering around freezing. 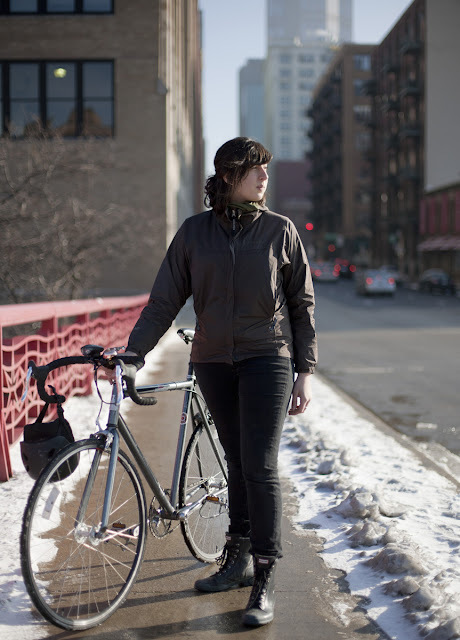 In the winter weather I love my Sugoi outer shell, my Detours TOOCAN bag, and my 100 % merino wool tights. Good wool tights are as warm as jeans, and look great with dresses. I also have a ridiculous amount of thrifted thin wool and cashmere sweaters to layer with. 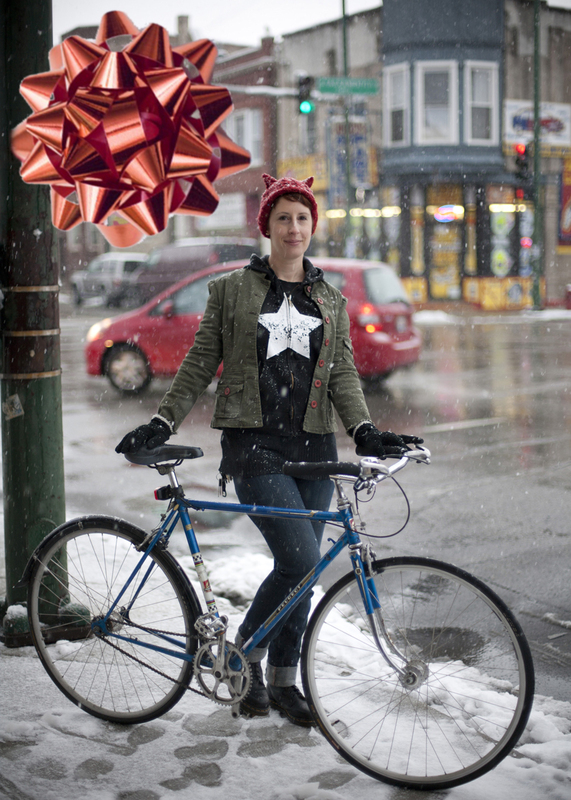 The snow is coming so hopefully I will have some fun winter bike photos to post on Monday. 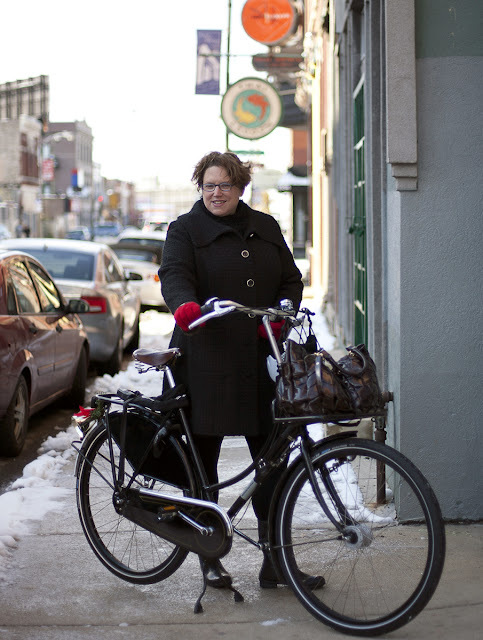 Shar rides a 2009 Masi Speciale with bull horns which keeps her torso upright and comfortable. 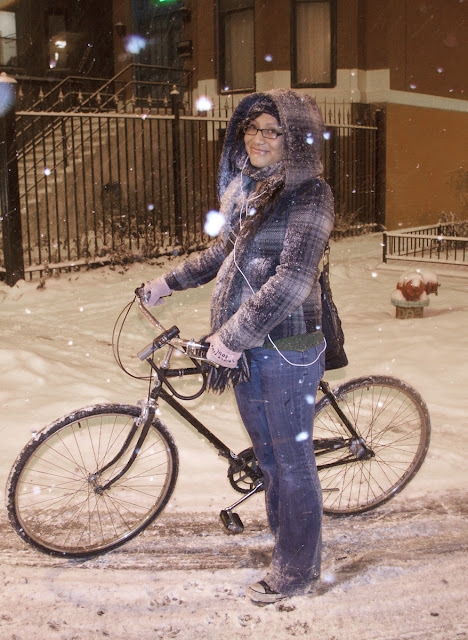 Cycling Tip from Shar: I ride in all types of weather, so having the right layers for rain, snow, wind and heat is important. All my jackets are set for rain, wind and all temperatures. 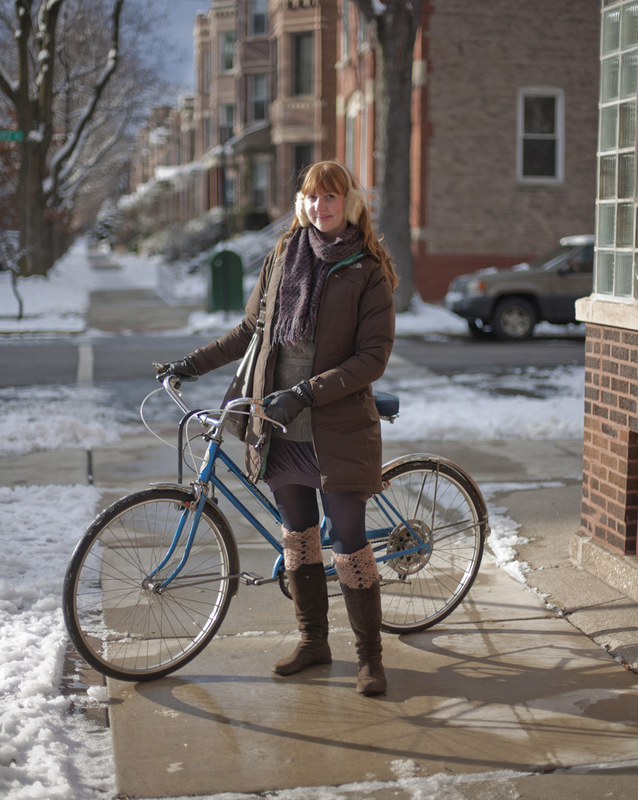 Being able to bundle up and shed some layers or unzip an air vent is great. It keeps me prepared and comfortable no matter what.